In the morning, your private guide and driver will meet you at the lobby of your hotel. 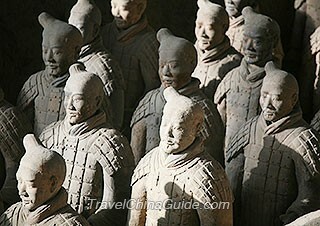 Then we will transfer you to visit the Terracotta Warriors and Horses Museum, the world's eighth wonder. The lifelike warriors and horses were orderly arranged in battle formations, which were believed to be the guards of the first emperor Qin Shihuang's Mausoleum. Lunch is arranged on your own, but our guide is glad to offer you some suggestions. In the afternoon, we will transfer you to downtown and visit the Great Mosque, which is a perfect combination of Islamic culture and traditional Chinese architecture. After that, we will leave you some free time to explore the nearby famous Muslim bazaar, where many delicious local snacks, unique and interesting souvenirs may arouse your interest. Finally we will transfer you back to your hotel. Today, we will firstly drive you to visit the City Wall, another landmark of the city. 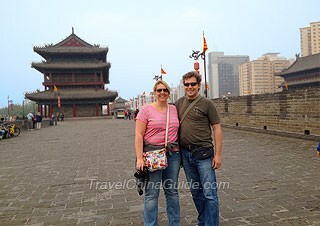 Built in the Ming Dynasty (around 14th century), Xian City Wall is the best-preserved one in China. Standing on it, you can have a bird's eye view of this ancient city. If time permits, you can either walk or have a short cycling on the wall to explore the history of the city from every brick and tile. 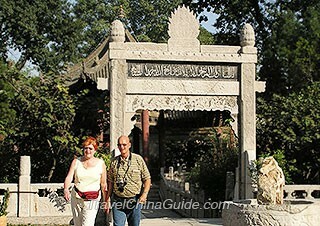 Later, we continue to visit the Small Wild Goose Pagoda & Xian Museum. In the afternoon, we will spend the time at Shaanxi History Museum. There are more than 370,000 historical relics exhibited in the museum according to the time and themes, spanning from the prehistory to modern China. It is not exaggeration that you could trace the thousands of years' Chinese history here in hours. As the visit comes to the end, our guide and driver will transfer you back to your hotel. Remarks: We can also assist you to book the hotel and offer you a preferential price. Your private guide and driver will pick you up at your hotel this morning. Today your trip starts from the tremendous underground army that was built to protect Emperor Qinshihuang after his death, the Terracotta Warriors and Horses Museum. You will visit the three pits in the museum. The No.1 Pit is the largest and first unearthed pit, which has over 6,000 full-scale terracotta warriors and horses. At present, about 1,000 of them have been unearthed and ranked at a well-organized battle array. These warriors' facial expressions could be seen clearly although they have been buried for more than 2,000 years. Lunch is on your own arrangement with our guide's help. 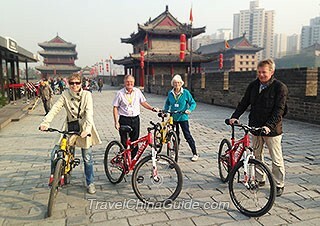 In the afternoon, you will visit the Small Wild Goose Pagoda & Xian Museum and the ancient City Wall. After that we will drive you back to your hotel. After picking you up at your hotel, our guide and driver will transfer you to visit the Great Mosque. It would be very quiet in the morning and you may enjoy a peaceful time there. Outside the mosque is the bustling Muslim Street where you may find delicious local snacks and interesting souvenirs. Later, go ahead to visit the Bell and Drum Towers which are with walking distance from the mosque. Located in the center of the city, the towers have witnessed the city's huge development since the Ming Dynasty. In the afternoon, we drive you to visit the Hanyangling Museum which is the tomb of a Han Dynasty emperor and empress. At the museum, visitors are also able to get into the grave and have a close look at this thousand-year old royal tomb. Your happy and private vacation comes to the end. Then we will transfer you back to your hotel. however out train does not arrive until 10am and we plan to get the tourist bus to the warriors. Please can you advise if it is necessary to book tickets in advance or will we still be able to collect tickets on the day? You can buy tickets on that day. After all, booking tickets in advance needs someone understanding Chinese. Can I get direct coach from Xi'an Airport to Citadines Central at Bei Lin district. Take shuttle bus Nanshaomen Line to the final stop, which is about 3km from your hotel. So you can take a cab to the hotel within 5mins then. We will arrive Xianyang Airport Monday night about 11:40pm. What is the better way of transport to get to Jinjiang Inn Bell Tower branch? And cost how much for Standard Taxi at the airport to there or other transport. Worried it will be problem as check out airport will be over midnight and surcharge on taxi will be high and public transport is not available at this hour. If taking a taxi to the hotel, it costs CNY150. By shuttle bus, I suggest you take railway station line to Longhai Hotel (CNY25), which runs till 02:30 the next day, then take a taxi to your hotel with CNY10. Don't worry! It is quite safe and convenient to go by eithe means of transportation. I stay at Zhubashi Rd. You are suggested to take Shuttle Bus –Nanshaomen Line to Xi’an Hotel, which takes about 1h 40 minutes and CNY25. After that, take a taxi to Bell Tower, and it takes about 5 minutes, CNY10. As for returning transport, take a taxi back to Xi’an Hotel, where the Shuttle Buses also back to airport. I will be arriving at 11:15PM. I will be staying at Ancient City Youth Hostel. Which bus line should i take? I notice that some line last depart are at 7:00PM. thanks! Hello there. You can take shuttle bus Railway Station Line to Longhai Hotel, and the bus won't stop until 2:00 the next day. Upon getting off, take a taxi to reach the hotel within 5min at a cost of CNY10.